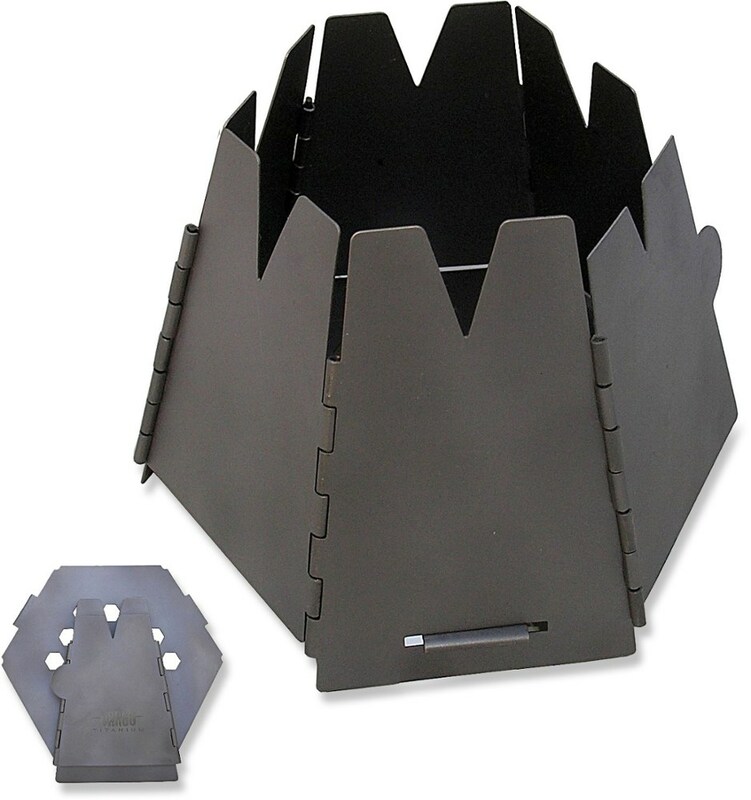 The Vital Stove is a good quality, compact twig stove that uses a tiny battery powered fan to burn twigs and ground litter completely and cleanly. It is compact, easy to use, requires extremely little in the way of fuel and, best of all it offers very good temperature control. It can boil fast but also achieve a long slow simmer. Not ultra-light, but fuel needn't be packed in. Cannot be used in areas where fire bans are in effect. Stove must be fed twigs and ground litter while cooking. My wife and I have been lifetime users of open fire cooking and Trangia (alcohol) stoves, but in the last three years we've come to favour the Vital Stove, which is a fan-powered twig stove. 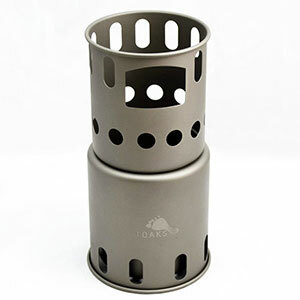 So far, I have found it to be an excellent stove, performing much better than I expected it to, being more versatile than the manufacturers have advertised it to be. Solidly built, well-engineered, works as it should with no fussing required. Not flimsy like the Sierra Zip Stove. Stable and hard to tip over accidentally, even with a large heavy pot of water atop it. 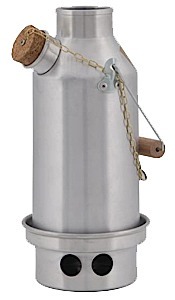 Uses extremely little fuel to boil or cook with, so you don't waste time processing wood/fuel before you start cooking. 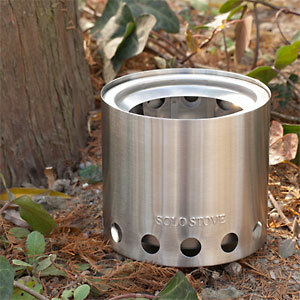 You can boil water with this stove in less time than it takes to gather/process the wood for stoves like the LittlBug. The pot supports are adjustable, so it can hold very tiny cups or large and heavy pots. 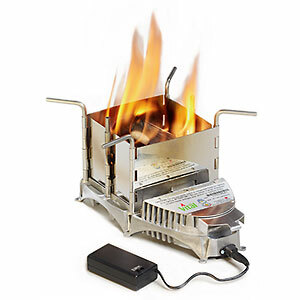 There are two speed settings for the fan and a damper mechanism that let you raise and lower the flames and the heat of the fire very quickly, affording more temperature control than any comparable wood stove, alcohol stove or even most gas stoves with fuel control valves. This was the biggest plus for me. My wife was able to bake a rising loaf of bread because she could effectively control and maintain a temperature. We are able to fry eggs over-easy at a low temp without burning them just as easily. It folds up flat when not in use. There is even a little storage compartment in the base in which I store the little fan controller box, keep spare batteries, a lighter and some dry tinder. It's not a light stove. 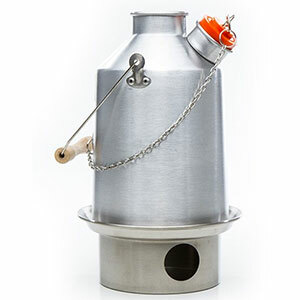 At a pound and a half, this is not the stove for ultra-light backpackers, but for the canoe-tripper who usually carries a lot of fuel and fuel containers, it's a very good option. If you're an ultra-lighter on long trips and have to carry a lot of fuel, then this is still a good option. It's technology dependent. The stove works like a forge. Two AA batteries power a small fan to blow air into the firebox. If you're like me, you don't like the idea of having gear that's dependent upon batteries (flashlights, GPS, etc), but at least the battery life on this product is very good. Another concern with a stove that has moving parts is part replacement. 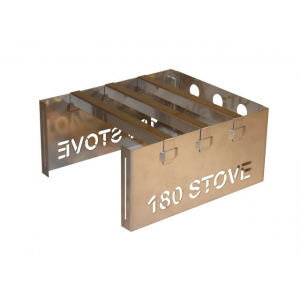 The manufacturers (Sol Huma/ VitalGrill) sell all the component parts separately, so you don't need to buy a whole new stove if you damage some part of it. The most vulnerable part is the battery holder and it can be replaced for under $5.00. You can't just walk away and let your food cook because the firebox must be fed. If you're going to simmer something at low flame/coal setting, you can use chunky pieces of hardwood and walk away for a few minutes at a time, but if you're after a quick boil, you need to be feeding it as the forge-like stove needs pretty constant feeding. Like any twig stove, it might might not be permissible to use in parks when fire bans are in effect. For instance, during fire bans, many parks only permits twig and wood stoves if they are equipped with a spark arrest screen. It's not ideal for ultralight backpackers or one-night trips, though I have to admit I find it so easy and unfussy, that I carry it in my day pack for short day trips. It is, in my view, ideal for multi-day trips where twigs or ground litter are available as one need not bring fuel or fuel containers. On sites which have been heavily used and firewood has been depleted, or on islands sites where one should be sparing in one's use of wood fuel, it makes good environmental sense. For a twig stove...it's a little pricey. It sells for about $80 CDN, which is $20 more than other twig stoves and fan-powered stoves...but it's better built, more stable, offers better cooking control. In Canada, Home Hardware carries them or will order them in for you. I have a Youtube review and cooking demo for any who'd like to see the stove in actual use. Just search for: A Vital Stove Breakfast and Review. Just got the stove a month ago and have been using it religiously ever since, hasn't let me down yet! It's small, and very compact. I admit it's not the lightest, but that is countered by the fact I no longer have to carry fuel with me, which is win win win! Did I mention this stove is hot? It works flawlessly I'm glad I fell on this neat little stove! Powerful: boiled 32oz of water in less than 3 mins! Inside the box, comes the stove with (1) battery pack (2 AA batteries not included), (1) pack of firestarters, and (1) nylon carry bag that perfectly fits all of the above. It took me literally just a few seconds to get a fire started for the first time. 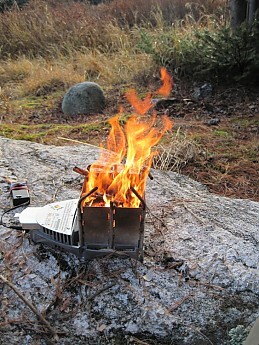 All I had to do was: Pull away and unfold the fire box, put batteries into power pack and connect it, light a firestarter and start the turbines! Once a flame is light you can throw in any biomass (I used twigs). Almost instantly the fire grew nice and strong. 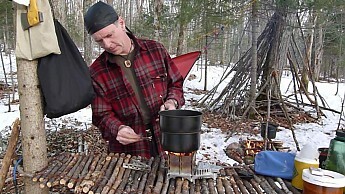 All-in-all, this is a solid stove (Made in Canada), very stable, very efficient and effective. Is exactly as announced +more! I definitely recommend this for all campers,hunters and survivalists! Works great, but without the battery pack working it is useless. So where can I buy a new battery pack? I want to know where I can buy the complete battery pack. The two-speed fan only works on first speed, not the second speed. 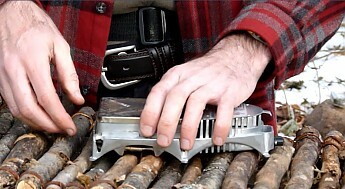 The SolHuma VitalGrill Survival Stove is not available from the stores we monitor.